Normal mission: Escape from the GUN raid! 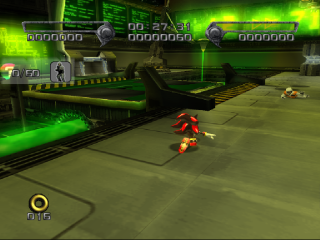 The Doom is one of five possible fourth stages of Shadow the Hedgehog; in the game's branching path structure, it follows from taking a somewhat evil, Black Arms-aligned path through the previous levels. Set inside Shadow's own flashback, The Doom recounts the events of the GUN invasion 50 years ago which shut down Project Shadow on the Space Colony ARK. This level, along with the other past-ARK stage Lost Impact, is notorious for being labyrinthine and time-consuming. Both the Hero and Dark missions require Shadow to search out secret passages in similar-looking corridors to hunt down the last injured researchers or GUN troops. Be prepared to make heavy use of the save points' teleportation facility to backtrack through the stage and re-investigate different routes. Shadow wanders through the forest after his last mission, back to introspecting about his identity just as he did at the very beginning of the game. Once again, Black Doom manifests in front of the hedgehog, though this time with a more powerful illusion - the entire world melts away as Doom apparently delves into Shadow's memory, to produce a simulacrum of the events on the Space Colony ARK 50 years ago. Watching from afar as his past self flees through the corridors with Maria Robotnik. This entire level therefore seems to take the form of a flashback; Shadow remembering what he did during the GUN assault that shut down Project Shadow. Not free of moral choices even half a century ago, Shadow can defend the ARK by fighting the GUN troops directly in the Dark route, spurred on by Doom's Eye (though whether Doom was physically there on the ARK 50 years ago, or is simply inserting himself into the memory to mess with Shadow's head, isn't clear). Alternatively, do as Maria says and bring healing units to the injured ARK researchers; or take the third route and simply escape with Maria as fast as possible. Whichever course Shadow chooses, his and Maria's escape after the level is blocked by the GUN Heavy Dog boss. This page was last edited on 31 October 2017, at 18:17.